With the state's strong Hispanic influence, the chili pepper has become a staple food in Texas. Therefore, it's only natural to look toward Texas for top quality hot sauces. Some of my absolute favorites, SuckleBuster's included, are produced in the Lonestar state. SuckleBuster's Texas Heat pepper sauces are natural pepper and vinegar blends. I reviewed Texas Heat Original a few months back and recently had the chance to check out their Chipotle Pepper Sauce. Chipotle is SuckleBuster's most popular pepper sauce and one of its most decorated. "Chipotle" is a thick pepper and vinegar sauce accented with chipotle powder and mustard. The flavors are bold with a good amount of tang and smokey spice. I would characterize the heat level as medium-hot. It's the type of sauce that only requires a few drops to spice up any savory dish. The depth of flavor from SuckleBuster's Texas Heat line goes significantly beyond the typical Louisiana style pepper sauce. The mustard and complimentary spices provide a unique profile. The mustard is noticeable, especially in the sauce's aroma. Texas Heat Chipotle Pepper Sauce is another exceptional, top shelf product from an outstanding company. 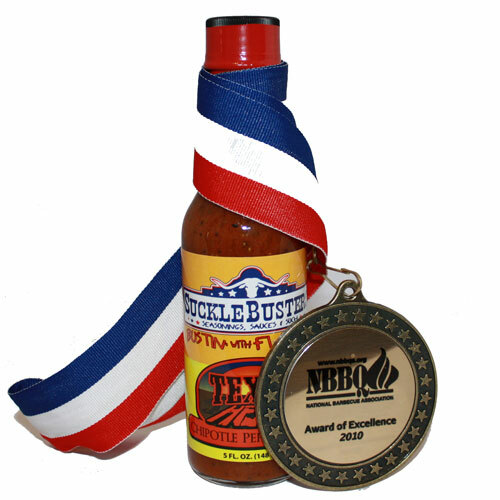 SuckleBuster's produces a wide range of award winning products from BBQ rubs to salsas. Learn more about the entire SuckleBuster's line on their website. See how Texas Heat Chipotle rates on our "Product Reviews" page. 0 Response to "SuckleBusters Texas Heat Chipotle Pepper Sauce"